The milk I haul is for upstate. I have special hatred for dfa. They are a special brand of corporate criminals. Before I got my cdl I actually worked for those criminals. Most of the farmers don't like dfa either. I worked in a dfa plant, as a reciever. They fired me for vaping. Don't assume it was in the building because I was outside. When hired I was never informed of any such policy intentions. When I started the job I went outside no one cares, then in the span of 5 months they changed their idiot policy 3 times. I couldn't vape outdoors, couldn't vape in my car, was told to seek nicotine addiction treatment. I am a former smoker. They left me in the facility Every night by myself, which in itself is kind of a no no. I would go outside because no one was there, why should it matter.... who exactly was I affecting. Caught once, no written, no verbal, no suspension..... They terminated me the day I returned from vacation in the parking lot. They lied at said they wouldn't fight unemployment. They fought it and LOST the case. They treated me like I vandalized property or committed theft, and no such offense occured. Since I was on unemployment I was given a grant to obtain my class A. I paid $195 for my cdl out of pocket. Their ridiculous policy was never in writing nor did they have a disciplinary process, termination seemed to have been the first step, lol. As a milk hauler it doesn't really matter because you aren't working for dfa..... I thought I would tell my story though. I really truly think the are the spawn of the devil. My receiver licence is actually a part D, plant worker I'm still good for a while yet. These people were so bad to work for the general manager told me he didn't like the sugar in my Lipton iced tea. He did this for times. I went to my supervisor and told him this must stop immediately. He apologized only because he probably realized I could use for harassment if it continued. I am a farm pickup driver. i take an empty trailer to 2 farms; take that back to the yard, do a drop and hook and take the 2nd trailer to 2 or 3 more farms. sometimes i take one of those loads to a local plant (o-at-ka) and do a delivery. i do local driving on an assigned route, and go home every day. i make a little over $1k per week take home about $840 per week. the truck is a 2010 kenworth T660 with 382K miles on the clock.... it might not be as new as the large fleets but its a low mileage, well maintained truck AND its a day cab. it has a cummings ISX and an 18 speed manual transmission. overall not a bad gig, i think im going to stick around for a while, and maybe move on to something better that pays more (after all ..... so long as it's local).i dont think 55K per year is a bad starting place. Podcast: Are Major Carriers Nothing More Than Starter Companies? My Werner trainer was terrible, he had only been driving for two years, he was actually 23 years old. What made him qualified to be a trainer when he only had limited experience himself. I was really just lining his pockets with my miles. Did I learn something, of course, I do every time I drive. When I left Werner I did dump truck for a while, which is probably easier then tractor trailer but you still gain some relevant experience. When I went to Walton I was given 3 weeks of GOOD training, allot of it with the owner himself. He has been driving almost 40 years, a top notch driver. Sorry to say but I think i learned more from him. He truly knows to drive and is a good teacher. He also has a driver that was former Werner trainer and he also helped me, he has been driving 20 years. Walton has 40 some trucks, but the point is sometimes smaller companies do have some training abilities, but the insurance companies and industry is not setup to allow them to take people straight from school. I had 1 year roughly of driving class A and class B trucks before I went there. In regards to surge, that is the movement of product inside the tank.... always try to load it as full as possible. Surge will be the worst when it's about 1/2 full. Two compartment trailers are better then single compartment trailers. If you have a two compartment trailer and only a 1/2 load, fill the front as much as possible and any remaining product in the back.... always load the front first. The last thing you want is an empty front compartment and full back compartment. By the way I have over 1 full year in accident free, so perhaps my methods were different then what other people have done, but it worked. I have a clean mvr and nothing on the dac. We all have to find our own way. the first time i stepped foot in a truck i really only wanted local job, i had little interest in ever driving OTR. when i got out into the "field" i discovered that was next to impossible. when i came home from training, it was springtime and i discovered there was a company that would hire me, so i took it. i never returned to OTR. You have to decide how important family is. for me, family is number #1, having a relationship with my child (now two kids i have a newborn) and my wife of 13 years was far more important. perhaps i did take a different approach but i did not want to screw up my successful marriage of 13 years, my son was also acting up in school in my absence. my wife was having difficulty keeping everything going at the house, keeping the driveway cleared out, and god forbid if she had car trouble (i do my own repairs). IF i had stayed with werner i would have had only 34 hour home per week and for the sacrifice of seeing my family on a daily basis i would roughly make about what i make now. this summer i worked for serafini construction, it was actually a great experience. they were really good to me and the company is run by a good woman. i drove a sterling tri-axle dump truck and got allot of rate work ($21.69 per hour), unfortunately it was seasonal work. i left on good terms and was told i am welcome back, should i ever need a job. i also drove class A fertilizer truck which was a good experience BUT we had far too much rain and it was only getting 1 or 2 days of driving sometimes per week; so i went to serafini. serafini is not a bad company to work for. leaving my wife for 8 weeks was a huge emotional drain i was not prepared for. i have been with her and around her almost everyday since 2001. i think lowering the CDL age to 18 is not a bad idea, get people to consider this as a career choice BEFORE they have families. the OTR lifestyle is a poor fit for family life. as far as driving a class B truck, i think it was a positive experience. it gave me an opportunity to handle the weight, air brakes, and shifting an eaton manual without dealing with the trailer length. the werner trainer i had was very poor and i was just someone on the truck that could run up miles for him to make more $$ off my back. i was no where near prepared to drive that 53' trailer into places like NYC. serafini was almost all city driving so it gave me some seat time driving a truck in the city. i now have a rural route and i like that. this is not an easy industry to get a start in. i decided i would only drive a day cab, or i was going to get out. family is most important to me. I have not been on here since i was insulted and called a "failure" for leaving werner. anyways i left werner and did dump truck over the summer, no desire here to drive OTR, not at all..... i really enjoyed dump truck but the work is mostly seasonal in nature so this late fall when the work ended i went back to class A this time milk tanker. i am a farm pickup driver for walton milk hauling. its not too bad i gross about $1k per week, and yes its the same deal..... i get paid per day, which is one of the few things i dont like about the job. you just have to get that out of your head and run the truck in a safe manner, if it takes me longer on a crappy day so be it..... treat that tanker like its WANTS to roll over and kill you. they are smooth bore tankers and well known for roll over accidents. if the corner is rated for 50 mph, im going to do 35 mph. you must respect a smooth bore tanker. being with my family was far more valuable to me then living on the road. i make $55K per year roughly and i sleep, shower, and live at home. i posted on here because this post is relevant to what i am doing, and if i can offer advice i will. RESPECT THAT TANKER, above all else. The road training was good and the classroom training was decent, im afraid backing training at least i found wasnt so great. they basically give you a worn out truck in an open parking lot and tell you to have fun. they dont teach you the right way to back up. the cost of BTTI is about 1/2 of what NTTS costs, so the cost is allot less. Ive been reading threads on here for about a month and have to say THANK YOU to everyone this site has the best info and members anywhere. Ok so i have 3 more weeks of cdl school at BTTI in buffalo NY (hamburg) I have been doing lots of research and already have a pre employment letter from PGT for their flatbed division and wondering of any other companies with lines in my area that hire us noobs. that's also where i went to school. the road instructors are some good guys. dennis, mike, and joe. Pitkin, Schneider has regional jobs that supposedly get you home every weekend. perhaps someone that knows more then me could chime in on that. i was considering going there at one point. the only thing that concerned me was the length of their training program. i believe its only one week. after the length of time werner left me sitting in a hotel, and the inconsistency of the trainers i really cannot recommend them. some werner trainers are great and some not so much. i actually had a room mate at werner that his trainer wrecked the truck while he was sleeping in the bunk. i dont know if all companies are like that. given my limited experience and the chewing i have already received i will let someone else comment and lead the rest of the discussion regarding schnieder regional. i fully understand wanting to see your wife and child. no one wants to screw up their relationship with their child or their marriage, heck we are in the same boat. I also have allot of resentment and anger built up over things that have nothing to do with trucking. the last full time, non-trucking job i worked i worked for some very unsavory people. I am a former smoker and a current vaper. i was fired from my last milk receiver job for vaping outdoors. when i was initially there was no "tobacco" policy. i would go outside on my designated breaks and vape no questions, no problems. after about 4 months on the job, they informed me i would have to go to the car. so i did that no problem. after about 6 more months they changed it yet again to leave the property. they left me at the facility by myself every afternoon. i would load trucks, cip silos, separators, and trucks. yes i will admit i would go outside on break and vape when no one else was around. i got caught once, no written nor verbal warnings simply your fired (the day i came back from a week of vacation they met me in the parking lot with my locker contents). the policy was never in writting and a handbook was never issued. these people had harassed me months earlier and told me to seek "nicotine addiction" treatment (really dont know if such a thing exists). not only were they un-reasonable with their policies but they harassed me about my personal habits that have no effect on job performance. the general manager also thought it was OK to make dumb remarks about the lipton iced tea i was drinking, apparently it had too much sugar in it for his liking. not once but multiple times. the first few times i completely ignored his remark, i would say something like "thats nice you feel that way". i think the third time i told me boss that this jerk had to stop. eventually he apologized because he probably realized he might be heading for a lawsuit. after loosing my job working for these nitwits, i realized that nearly all of the manufacturing jobs have been taken over by temp services. we probably have 30 or so of these organizations in our area. i have 10+ years of experience working in food manufacturing facilities. i have a raw milk receiver license, which is still current and i have ran a variety of packing and other types of manufacturing machinery. going to work for $12 per hour isnt going to pay bills and its not something im willing to do. if you work for a temp service you might as well burn your resume because now your experience is worth and means NOTHING. you wont make anymore then someone who has never worked in that type of environment. after looking for another manufacturing job for a few months and coming to the realization that there wasnt anything worth working anymore, i thought about what i could get into that did not take years of college and MORE debt to get into that pays a living wage. somehow i came up with the conclusion that i should try truck driving, the state helped me get my CDL. i also like the idea that no one is going to fire me for vaping or smoking, and as long as your personal habits arent considered illegal or go against what is in the CDL manual you wont loose your job over something so stupid. you wont get harassed about things like that. if you want to drink a soda or vape no one is going to care. so yes, i do have things i am bitter and resentful about but i have to somehow let them go. That being said, yes i do agree with allot of what is said here, i am perhaps too negative. i will say that if i thought i had to drive over the road i never would have went for my CDL. the thought of being away from family that long is not something that i would enjoy. im talking specifically of my wife and child. Another legendary verse from the "Truck Driver's Misinformation Bible"
i watched my brother in law work that dollar account as new driver. multiple accidents and backing accidents he sits around with no job. yes, i do have a bad vibe about the dollar account. I wont take anything away from people that are willing or want to drive over the road, but im not in that crowd. my goals are being a safe driver, getting home as much as possible, and making a living wage. going to the dollar account very well might not be a safe choice for me, driving over the road is only going to get me home a couple days per month. choices, choices choices none of them are perfect. 2 leave of absence, never actually got promoted to a solo driver, went through 2 trainers. You failed hard, you dun goofed everything. You have so much pride and ego I wouldn't be surprised if you erect statues of yourself in your front yard. The writing's on the wall but you worship yourself so in your eyes you didn't fail. Listen, we dont hold it against you, none of us do not even a little bit. Trucking isnt for everyone. Its one of those careers that you either win big or lose big. You couldn't put me in a 9-5 desk job, I will fail it because its not for me and I wont be good at that. Theres certain things in life I fail at and have failed at. 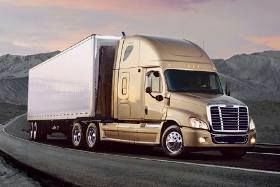 Trucking was that to you yet you blind yourself to reality and think a small, local company will be your saving grace. We all could have done something better in life. Its okay to step back and admit your faults and that you're not perfect. Sometimes the best way to fight self-love is to point the finger at ourselves. first of all yes, i have heard that said about the big carriers constantly "starter companies", i have heard it so many times that i was believing it. the company i have chosen to go to is large enough to still have a decent amount of resources so hopefully i will avoid some of the problems the very small companies have. they are big enough use something called peoplenet which is similar to qualcom. as far as my leaves on absences, it is the pain of being separated from my family. i actually did pass everything at werner, i could still go back if i choose, i have not officially closed the door yet. i am on up to a 30 day leave right now. i decided to try and find something that perhaps would better fit my attempt at maintaining some form of family life. if i went back to werner i could get my truck assignment, however being on a dollar account i am afraid i have been set up for failure OR going to OTR which is something i flat out refuse to do. i dont know if you guys understand i tested out successfully, but i am very much afraid im gonna hit something if i stay on a dollar account. that dollar account very well might end my carrier, as you guys say chew me up and spit me out. i stayed out 8 weeks, 6 weeks on the trainers truck, 2 weeks in the hotel. i went on a leave after i completed my time with that trainer. i didnt get off the truck until i was done. i feel i am woefully unprepared for a dollar account and OTR is not a good fit for my family situation. if i had at least been able to go home to see my family a few times during training, i never would have gone on a leave. let me repeat, i was promoted to solo driver, but i just see things arent going to pan out for success in the long run. i will NOT have an accident, i will not screw up my career, damage equipment, and i will not kill anyone. I havent hit anything so saying im a total disaster would be a stretch. im not going to call myself successful either by any stretch of the imagination. i have yet to have a successful start. i am also aware that a dollar account is not going to be a good fit. my brother in law who previously worked for werner on a dollar account had multiple backing accidents. i have heard from other werner employees how bad the backing is. my trainer gave me almost no backing practice. if i was interested in driving OTR i would try stick it out with them. i have zero interest in such a lonely, miserable life. great for single people and divorcees. so if i am not interested in driving OTR or staying with a dollar account, that leaves me with the option of going somewhere else that offers other options. so what makes me a total disaster? i would say im not established yet, i have not proven anything yet but total disaster is kind of an unfair analysis. total disaster would be damaging equipment, killing someone, or otherwise doing something utter stupid. also i sure did not ask to sit in that hotel all of those weeks. i should have jumped ship sooner but i didnt know where to go at the time. Ad, I hope everything works out for ya. I spent hours researching the industry and talking to drivers ( I was a truck mechanic ) and thought I had it all figured out so I took the plunge and enrolled in swifts driving academy. Like you, my world turned upside once I was actually out on the road. Left my debit card at a truck stop, missed my brothers graduation and even dropped my pillow in bird doodoo walking around the swift terminal in Memphis. All these little things added up and I bailed after a few months with the assumption finding a local job would be easy lol. I found a job with a equipment rental company and ate some crow for a bit working in the yard and driving a class b truck. Got promoted a few months ago to a semi driver finally. These opportunities do exist for rookies but it requires hard work and a good attitude. It's good money and I'm home every night just long enough to shower and eat before bed time but not a day goes by that I don't regret not finishing out the year with swift. there's a good chance you'll feel the same way about Werner one day. Good luck to you sir! i can relate to most of this. i did not loose my debt card but i set it up on the dash after i bought into the truck stop wifi and that damned thing slid into the dashboard plastics on the truck where i couldnt reach it. had to get the card replaced when i got home. my cell phone, i couldnt find the stupid thing and i ended up replacing it. it ended up showing up later but it really made me panic, not only was i several thousand miles away from my wife but now i couldnt even call her. i was an emotional mess being away from my wife and son for such a long time brought me to tears, literally. i hated it with an absolute passion and i vowed to not do OTR ever again. i dealt with the first week or two ok, but when i started to get past a month i started to loose it. while i was driving, part of my focus was on driving but part of my focus was on my wife and child. what i am leaving werner to go to is a medium sized carrier 3-400 trucks. they are big enough to offer some of the advantages of larger carrier but i think small enough to still be considered a family run business. its ran by two brothers. perhaps if i could have found them first i could have avoided the unpleasant, emotionally painful experience that was for me, over the road. if that lifestyle of being gone suits some people and they do well on it, i would never take that away from them. im happy for them. if werner or any other company is a good fit for many of their drivers, again i would never try to take anything away from them. im glad they found a place they fit in at. however that OTR experience was a terrible fit for myself. its really great for people like my trainer, he is 25 years old and still lives at home with mom and sister, heck if that was me i would want to escape that too. If dollar accounts are something that as a generalization is not good for a new driver, why do they place so many new drivers into that role? is the worst part worrying about both unloading and driving, and it ends up just being too much for a new guy to handle?